JONATHAN STRANGE AND MR NORRELL: Episode 3 Review | Warped Factor - Words in the Key of Geek. Watch the lady sawn in half, says Tony Fyler. 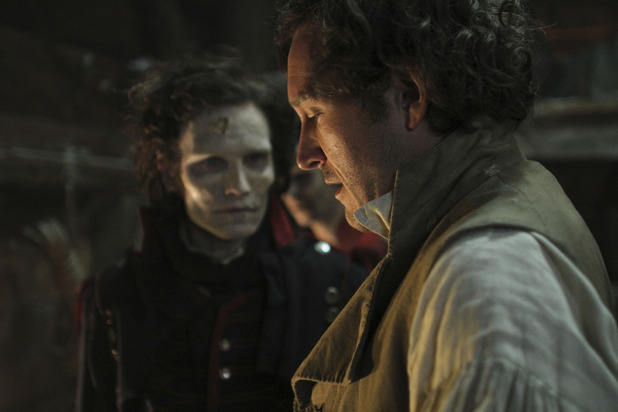 Episode Three of BBC’s adaptation of Jonathan Strange & Mr Norrell continues where Episodes One and Two left off – convincing the viewer that the mammoth book is one to read after all. In the tradition of typical Napoleonic novels, the action in this episode is divided between home and away, the life of London and the life of the soldiers at the front, handily split in this instance with Norrell at home and Strange away at war. Meanwhile, Lady Pole, brought back from the dead by Mr Norrell in Episode One through the auspices of the increasingly creepy Gentleman (played by Marc Warren with the sleepy powerful eyes of a shark) continues to run ‘mad’ – prevented from speaking of her true, enchanted state by the semi-Gothic notion of ‘a rose at her mouth’ and continuing her friendship with Belle Strange. Much of the episode details Strange’s adventures at the front – at first despised or hardly noticed by the troops, winning friendship and confidences with his easy nature and his ability to read the letters of love, and indeed of betrayal, from the soldiers’ sweethearts. Hearing concerns from the troops of the Portugese roads and how they wear out a man’s boots in no time, Strange builds them a magical road in another impressive ‘Strange-magic’ set piece, but is defeated by The Duke of Wellington’s demands that he move an entire forest to allow the English to take the French unawares. During the ensuing skirmish, his borrowed books are obliterated, and Strange has just his original volume, the history of the Raven King, left to him, but in a telling difference between the two lords of English magic, Strange cares little for the lost books and much for the life of the man who carried them around for him. In a delicious nod or foreshadowing to parodies like Price and Prejudice and Zombies, he is forced to draw on older, darker magic than that to which he’s accustomed to reanimate some dead soldiers to learn where Wellington’s lost cannons are located – a move that wins him the respect of the troops and the Duke, but which haunts him personally, as having brought the soldiers’ souls out of Hell itself, he cannot then find a way to make them dead again. Meanwhile in London, Norrell begins to act less and less like a gentleman, sending his mysterious servant Childermas to tell Segundis that his proposed school of magic cannot be allowed to go ahead (‘Sorry, Harry – Hogwarts is cancelled), intercepting post between Mr and Mrs Strange in case there is any correspondence about Lady Pole and her ramblings, and finally turning up in Lady Pole’s bedroom to tell her directly to stop trying to alert people to her condition. The Gentleman too gets more and more of the action here, attempting to seduce Belle Strange to his cause and showing Stephen the butler more of his past to bend him to his will for his future. When Jonathan returns home, we’re left with the sense of an impending storm – Norrell will want his destroyed books back, Strange will be the hero of England’s war-magic, and what has Norrell done lately except skulk about and be no help to Lord and Lady Pole? Episode Three delivers a more subtle idea of the contrast between its two chief protagonists than Episode Two did, but in its own way, it’s more pronounced – we wonder what these men will do when they are crossed, checked, or when the world tells them no. Strange is naturally more kind-hearted, more at ease with himself and the world, but we’ve seen him frustrated, and the raging power that can be unleashed as a result. Here we see Norrell in a subdued state of panic – holding his hand across Lady Pole’s mouth, quietly, calmly telling her that what he did he did for the future of English magic, and that innocent people have to suffer, equivocating her situation with that of the soldiers who’ve gone to war and then, shockingly, telling her she will live in her current state of ‘madness’ for 75 more years before leaving her to rail, and blocking any more contact between her and Mrs Strange. It’s the act of a suburban devil, a mundane horror, and it leads to an explosive conclusion to the episode. What, we wonder, will happen when the two English magicians properly cross swords and their viewpoints are at odds. Which – if either – will survive? What’s clear from Episode Three is that the massive book has many themes, and that any number of them can be highlighted at any given time – the themes of Episode Two are not quite the same as those of Episode Three, though there is a harmony and a flow between the first three episodes that displays an impressive sense of balance while delivering great geeky TV every Sunday. Bring on Episode Four!